Not to be confused with Al Jazeera America. It is a sister channel of the Bosnia and Herzegovina-based multi-language Al Jazeera Balkans, the online digital networks AJ+ and Al Jazeera Turk and the original, Arabic-language, Al Jazeera (sometimes referred to as Al Jazeera Arabic). The station broadcasts news features and analysis, documentaries, live debates, current affairs, business, technology, and sports, and claims to be the first global high-definition television network. 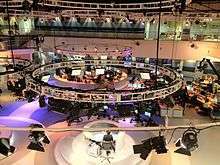 Al Jazeera English is the world's first English-language news channel to be headquartered in the Middle East. The channel aims to provide both a regional voice and a global perspective for a potential world audience of over one billion English speakers who do not share the Anglo-American worldview. Instead of being run under one central command, news management rotates between broadcasting centers in Doha and London. At its launch, the station actually had four news centres in the world: in Washington, D.C., London, Doha, and Kuala Lumpur. Complete news bulletins from Kuala Lumpur stopped on 30 September 2010 and from Washington, D.C. on 28 January 2011; they were replaced by news from Doha. All news inserts from Kuala Lumpur ceased in early 2011 and from Washington DC they ceased on 15 April 2012. By contrast, Al Jazeera English is one of the few global media outlets to maintain an agency in Gaza, and in Harare. The network's stated objective is "to give voice to untold stories, promote debate, and challenge established perceptions." Al Jazeera English has stated objectives of emphasizing news from the developing world, of "reversing the North to South flow of information" and of "setting the news agenda" (also the channel's slogan). Some observers, including media scholar Adel Iskandar, have commented that this focus can be seen, in the eyes of Western viewers, as casting Al Jazeera English as a global "alternative" news network, though the entire Al Jazeera brand has been heavily mainstream in many parts of the world. Other Al Jazeera English slogans and catchphrases include: "All the News | All the Time", "Fearless Journalism" and "If it's newsworthy, it gets on air, whether it's Bush or Bin Laden". Al Jazeera's Code of Ethics mirrors some of these statements. Award-winning creative teams shaped the English brand identity. The channel was launched on 15 November 2006 at 12:00 GMT (19:00 WIB). It had aimed to begin global broadcasting in June 2006 but had to postpone its launch because its HDTV technology was not ready. The channel was due to be called Al Jazeera International, but the name was changed nine months before the launch because "one of the Qatar-based channel's backers decided that the broadcaster already had an international scope with its original Arabic outlet". The channel is noted for its poor penetration in the American market, where it was carried by only one satellite service and a small number of cable networks. Al Jazeera English later began a campaign to enter the North American market, including a dedicated website. It became available to some cable subscribers in New York in August 2011, having previously been available as an option for some viewers in Washington, D.C., Ohio and Los Angeles. The channel primarily reaches the United States via it's live online streaming. It is readily available on most major Canadian television providers including Rogers and Bell TV after the Canadian Radio-television and Telecommunications Commission approved the channel for distribution in Canada on 26 November 2009. On 3 January 2013, Al Jazeera Media Network announced that it had purchased Current TV in the United States and would be launching an American news channel. 60% of the channel's programming would be produced in America while 40% would be from Al Jazeera English. That was later changed at the request of the cable and satellite providers to almost 100% American programing. Regardless Al Jazeera America maintained a close working relationship with Al Jazeera English. The channel aired Newshour in the morning and midday hours and cut to live Al Jazeera English coverage of large breaking international news stories outside of that. Al Jazeera English programmes Witness, Earthrise, Listening Post, Talk To Al Jazeera Al Jazeera Corespondent and 101 East along with Al Jazeera Investigates regularly aired on Al Jazeera America. On January 13, 2016, Al Jazeera America announced that the network would be terminated on April 12, 2016, citing the "economic landscape". In 2014, Al Jazeera moved its UK London operations including its newsroom, studios and shows from Knightsbridge to its new space on floor 16 of The Shard. The last day of broadcasting from the Knightsbridge studios was September, 12th 2014. The grand opening of the new Shard hub was on November 3, 2014 with the first Newshour broadcast on October 10, 2014. The new facility is capable of running an entire channel, independent from the other hubs. The London Shard hub is the second biggest hub in the Al Jazeera network, after Doha. In 2013 Al Jazeera Media Network began the planning stages of a new channel called Al Jazeera UK. If launched, the British channel would broadcast for five hours during prime time as cut-in UK content aired on Al Jazeera English. It would in effect function much like RT UK and RT America does in the United States. Counting the Cost — the weekly look at business and finance. Hosted by Kamahl Santamaria. Newsgrid − an high-tech news and live post. Launched on Nov 14, 2016 as part Of Al Jazeera English's 10 Year Aniversary Of broadcast. Also Airs On Facebook Live, aljazeera.com and the channel's Youtube Channel. Viewfinder - Fresh perspectives through the lens of local filmmakers from around the globe. Witness — the daily documentary-slot for films by the best of the world's independent film-makers. The strand aims to shine a light on the events and people long-forgotten by the global media and on those which never merited a mention in the first place. "The mainstream American networks have cut their bureaus to the bone.... They’re basically only in London now. Even CNN has pulled back. I remember in the '80s when I covered these events there would be a truckload of American journalists and crews and editors and now Al Jazeera outnumbers them all.... That's where, in the absence of alternatives, Al Jazeera English can fill a vacuum, simply because we’re going in the opposite direction." Al Jazeera English uses a combination of full-time 'staffers' and local freelancers. So long as the journalists are appearing - or are providing credited commentaries - regularly on-air, no distinction has been made as to their contractual arrangements. However, those who have received a recent on-air profile and whose names therefore appear in bold, may well be assumed to be on the staff. Names in Bold – subject, in 2013, of an on-air Al-Jazeera 'Profile', or puff; in the case of the programme hosts, this is in conjunction with a plug for the strand itself. Former CNN and BBC news anchorwoman and award winning journalist Veronica Pedrosa also joined the team, along with CNN producer James Wright, and Kieran Baker, a former editor and producer for CNN, who had been Acting General Manager, Communications and Public Participation for ICANN. On 2 December 2005, Stephen Cole, a senior anchor on BBC World and Click Online presenter, announced he was joining Al Jazeera International. The network announced on 12 January 2006 that former Nightline correspondent Dave Marash would be the co-anchor from their Washington studio. Marash described his new position as "the most interesting job on Earth." On 6 February 2006, it was announced that the former BBC reporter Rageh Omaar would host the weeknight documentary series, Witness. In mid 2014 Al Jazeera English froze employment of both permanent and freelance staff for its Qatar network and cut freelance pay rates by 30-40% with out warning, while at the same time Al Jazeera lodged a $150m claim for compensation against Egypt, arguing that by arresting and attacking Al Jazeera journalists, seizing the broadcaster’s property and jamming its signal, arguing that the Egyptian government has violated its rights as a foreign investor in the country and put the $90m it has invested in Egypt since 2001 at risk. The original Unit chief was Ahmad Ibrahim, but the current Manager of Investigative Journalism for the Al Jazeera Media Network is Clayton Swisher. Other leading figures include: Ed Pound, Karen Wightman, Trevor Aaronson, Frank Bass, Josh Bernstein, Simon Boazman, Will Jordan, Phil Rees, Ken Silverstein. At its launch, the unit had three separate teams. The channel is available in many countries, mostly via satellite, sometimes via cable. The channel is also available online. Al Jazeera English provides a free HD stream on its website for unlimited viewing. It is available free worldwide. They also provide a free stream on their YouTube page. Previously, before Al Jazeera provided an official stream, a low quality RealVideo stream was available for viewing. Al Jazeera news segments are frequently included on the American public television program Worldfocus. Al Jazeera can also be streamed on any iPhone, iPad, or iPod touch with a 3G or wifi connection using a free application. Al Jazeera English is available in the UK and Ireland on Freeview channel 133 and in HD on channel 108, Sky channel 514, Freesat channel 203 and Virgin Media channel 622. In April 2010, Al Jazeera English was taken off air in mio TV Singapore with unspecified reasons, according to the official Al Jazeera English website. On 26 November 2009, the Canadian Radio-television and Telecommunications Commission approved "a request to add Al Jazeera English (AJE) to the lists of eligible satellite services for distribution on a digital basis and amends the lists of eligible satellite services accordingly." Al Jazeera English became available on Rogers Cable, Videotron and Bell TV on 4 May 2010. With Al Jazeera's coverage of the Egyptian Revolution of 2011, the channel drew acclaim and received renewed attention. The New York Times reported on 1 February 2011 that 1.6 million U.S. viewers had tuned in via Internet stream, and stated that new discussions were underway with carriers. The following month, it was announced that Al Jazeera entered carriage negotiations with Comcast and Time Warner Cable. Salon.com described the channel's English-language coverage as "mandatory viewing for anyone interested in the world-changing events currently happening in Egypt", while Huffington Post contributor Jeff Jarvis claimed it was "un-American" for operators to not carry the network. When Al Jazeera covered the Libyan Civil War, U.S. Secretary of State Hillary Clinton noted an increasing American audience for the network, saying that "viewership of Al Jazeera is going up in the United States because it’s real news. You may not agree with it, but you feel like you’re getting real news around the clock instead of a million commercials and—you know—arguments between talking heads and the kind of stuff that we do on our news which—you know—is not particularly informative to us, let alone foreigners." In April, 2014 the Al Jazeera English show Empire wasn't geo-blocked in the United States. Shortly after the programs Indian Hospital, Viewfinder, Lifelines and Head to Head were available also. These programs were the only AJE shows officially non-geoblocked for American viewing during the time that Al Jazeera America was in existence. In December 2013, three Al Jazeera English journalists Peter Greste, Mohamed Fahmy, and Baher Mohamed were arrested in their hotel rooms in a Cairo Marriott arrested on charges of delivering "false news" and "aiding a terrorist organization" by being part of Al Jazeera Media Network in Egypt following the 2013 Egyptian coup d'état and the shutdown in Egypt of Al Jazeera Mubasher Misr. On 23 June 2014, the three journalists were found guilty by an Egyptian court. Greste and Fahmy were sentenced to 7 years in prison while Muhammad was sentenced to 10 years. The ruling was denounced by fellow journalists, including some at BBC, CNN, ABC Australia and most other major news outlets along with world leaders from Australia, Canada, The United States, United Nations, Switzerland and the United Kingdom primarily because they were found guilty based on no actual evidence in a case that has been deemed politically motivated and also because the ruling was seen as an attack on press freedom. The response was especially negative on the part of United States Secretary of State John Kerry who a day earlier was in Egypt and was made a promise of press freedom by Egyptian President Abdel Fattah al-Sisi. The ruling has resulted in many negative stories in print, online and on television by various news outlets around the world calling the Egyptian justice system a kangaroo court and calling the Egyptian government authoritarian. There were various calls for amnesty, clemancy and pardons by various governments and news agencies all of which were declined by the Egyptian government who claimed that their justice system was independent and to respect the courts decision and stay out of Egyptian affairs. There are also calls for the United States to end or hold funding for the Egyptian military in response to the case. Attempts to free the journalists are still ongoing. Peter Greste was released from prison and deported back to Australia on 1 February 2015. Al-Jazeera English has frequently been criticized for having an anti-American bias, although some commentators have asserted that this has been lessened over time. Emmy award winning journalist Dave Marash, who served as a veteran correspondent for ABC's Nightline, resigned from his position as Washington anchor for Al Jazeera English in 2008. Marash cited "reflexive adversarial editorial stance" against Americans and "anti-American bias". 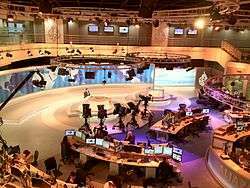 It is often unclear whether recent discussions of anti-American bias at Al Jazeera are referring also to Al Jazeera English or only to Al Jazeera's Arabic-language channel. There are significant differences in tone between the English and Arabic-language channels. (According to bilingual Palestinian journalist Daoud Kuttab, "The English channel uses more neutral terminology; the Arab channel is much harsher.") An example of this is a 2011 claim by Bill O'Reilly that Al Jazeera is "anti-Semitic" and "anti-American" and a subsequent defense of Al Jazeera against these claims made by former Al Jazeera English anchor Dave Marash on the O'Reilly Factor. Another example concerns statements by former US Secretary of Defense Donald Rumsfeld, who in April 2004 denounced Al-Jazeera's Arabic-language coverage of the Iraq War as "vicious, inaccurate and inexcusable," but took a more conciliatory tone in a 2011 interview for Frost Over The World, Al Jazeera English's news and public affairs program hosted by David Frost, praising the network as "an important means of communication in the world." On 12 October 2008, Al Jazeera English broadcast interviews with people attending a Sarah Palin United States presidential election rally in St. Clairsville, Ohio, with interviewees making comments about Barack Obama such as "he regards white people as trash" and "I'm afraid if he wins, the blacks will take over". The report received over 2 million views on YouTube. Following this the Washington Post ran an op-ed, claiming the news channel was deliberately encouraging "anti-American sentiment overseas", which was criticized by Al Jazeera as "a gratuitous and uninformed shot at Al Jazeera's motives", as the report was just one of "hundreds of hours of diverse coverage". Criticism of an Anti-American bias has been dwindling as their coverage of the Arab Spring received wide acclaim and calls for the network to be added to U.S. television. Since 2006, Al Jazeera English has won 45 prizes, medals and awards. ↑ "Al Jazeera International Commissioning"
↑ "Al-Jazeera Says Its English-Language News Channel Will Launch November 15" The Post-Star, 1 November 2006 Archived 7 October 2009 at the Wayback Machine. ↑ "Al Jazeera English launches on New York cable". The Spy Report. 2 August 2011. Retrieved 2 August 2011. 1 2 "Broadcasting Regulatory Policy CRTC 2009-725: Addition of Al Jazeera English to the lists of eligible satellite services for distribution on a digital basis". Canadian Radio-television and Telecommunications Commission. 26 November 2009. Archived from the original on 29 November 2009. Retrieved 26 November 2009. 1 2 DeMara, Bruce (26 November 2009). "Al Jazeera in Canada on Brink of Approval". Toronto Star. Retrieved 23 April 2010. 1 2 "Al Jazeera buys US channel Current TV". Al Jazeera. 2 January 2013. Retrieved 2 January 2013. ↑ Stelter, Brian (26 May 2013). "American Al Jazeera Channel Shifts Focus to U.S. News". The New York Times. ↑ "Veronica Pedrosa joins Al Jazeera". 20 November 2005. Archived from the original on 14 June 2006. Retrieved 3 June 2006. ↑ Al Jazeera Jump TV Archived 19 January 2010 at the Wayback Machine. ↑ Al Jazeera RealPlayer Archived 20 May 2009 at the Wayback Machine. ↑ "VDC Corporation". VDC. 1 November 2011. Archived from the original on 14 October 2011. Retrieved 14 November 2011. ↑ DeMara, Bruce (4 May 2010). "Al Jazeera English on the air in Canada". Toronto Star. Archived from the original on 8 May 2010. Retrieved 23 May 2010. ↑ Sirota, David (28 January 2011). "Why can't we watch Al Jazeera?". Salon.com. Salon Media Group. Retrieved 14 November 2011. ↑ "Burlington One of Few Places to Air Al Jazeera" Associated Press, 22 April 2007 Archived 28 September 2007 at the Wayback Machine. ↑ "Al Jazeera Meets American Resistance". Bloomberg BusinessWeek. 3 April 2006. Archived from the original on 11 August 2007. Retrieved 29 August 2007. ↑ Stelter, Brian (31 January 2011). "Al Jazeera English Finds an Audience". The New York Times. The New York Times Company. ↑ Sirota, David (28 January 2011). "Al Jazeera's Egypt coverage embarrasses U.S. cable news channels". Salon.com. Salon Media Group. Archived from the original on 6 September 2011. Retrieved 14 November 2011. ↑ Bauder, David. "Clinton Media Criticism Buoys Al-Jazeera". ABC News. Associated Press. Retrieved 20 March 2011. ↑ Loveluck, Louisa. "David Cameron 'appalled' as Egypt sentences Al Jazeera journalists to seven years in prison". The Telegraph. ↑ "Secretary Kerry: Prison sentences for Al Jazeera reporters 'deeply disturbing set-back' for Egypt". Big News Network. 23 June 2014. Archived from the original on 26 October 2014. ↑ "Al Jazeera closes English-language bureau in China after visa denial - CNN.com". CNN. May 8, 2012. ↑ Michael Wines (7 May 2012). "China Expels Al Jazeera Channel". The New York Times. Retrieved 8 May 2012. ↑ "The O'Reilly Factor – Monday, February 14, 2011". BillOReilly.com. Bill O'Reilly. 14 February 2011. Retrieved 14 November 2011. ↑ "Donald Rumsfeld Tells Al Jazeera 'I Am Delighted You Are Doing What You Are Doing'". Huffington Post UK. 30 September 2011. Retrieved 7 April 2012. ↑ Kauffman, Casey (13 October 2008). "Misconceptions of Obama fuel Republican campaign – 13 Oct 08". YouTube. Al Jazeera. 1 2 King, Colbert I. (18 October 2008). "A Rage No One Should Be Stoking". The Washington Post. ↑ Tony Burman, Managing Director of Al Jazeera English (25 October 2008). "Letter to The Washington Post". ↑ "Al-Jazeera goes from bad guy to good guy in the US". DW.DE. Deutsche Welle. 10 February 2011. Retrieved 28 January 2012. ↑ David Bauder (8 September 2011). "Al Jazeera English maps out 9/11 coverage". Bloomberg BusinessWeek. Bloomberg L.P. Associated Press. Retrieved 28 January 2012. ↑ Teemu Henriksson (19 April 2011). "Al Jazeera takes social media to the airwaves, targeting US audiences in particular". EditorsWebLog.org. World Editors Forum. Retrieved 28 January 2012. ↑ CyberJournalist Editor (19 April 2011). "Al Jazeera launches 'The Stream' social media experiment online". CyberJournalist.net. Jonathan Dube. Retrieved 28 January 2012. ↑ For United States IP addresses, this URL redirects to the website of Al Jazeera America. The Al Jazeera English website is accessible via a link at the bottom of the Al Jazeera America homepage or at the top under the International pulldown in the upper right hand corner.